This post originally appeared on the U.S. Department of State DipNote blog. 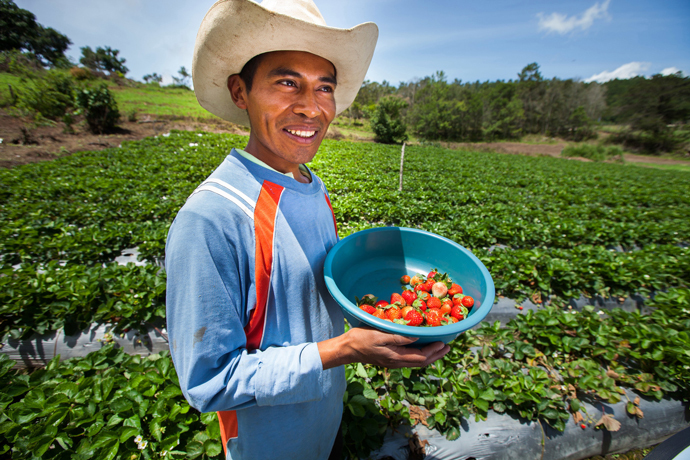 Emiliano Dominguez Gonzalez displays his recently harvested strawberries in Honduras. Feed the Future helped nearly 7 million farmers like Emiliano last year boost harvests by using new and improved technologies and agricultural practices. / USAID-ACCESO/Fintrac Inc.
For generations, the United States has been a leader in providing development assistance across the globe to alleviate suffering. But global food price spikes and resulting instability in 2007 and 2008 were a wake-up call: More needed to be done to break the vicious cycle of hunger and poverty. The answer: Unlock the potential of agriculture as the key to reducing hunger, extreme poverty and malnutrition through an initiative that became Feed the Future. In just a few short years, Feed the Future is already changing the face of hunger and poverty for some of the world’s poorest families. 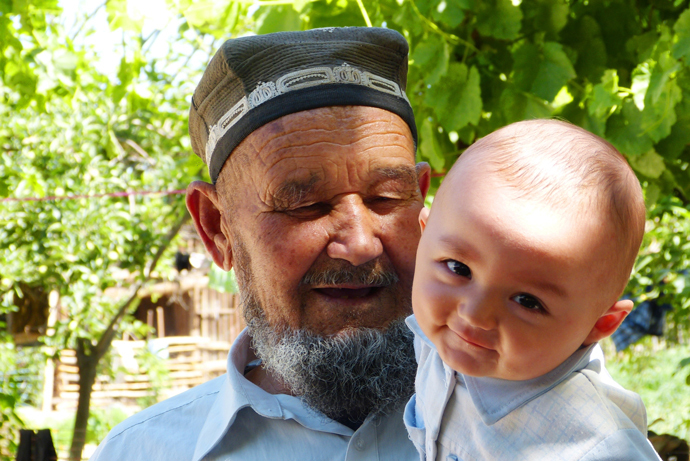 In May 2014, Feed the Future released its Progress Report on FY 2013 results , revealing that the initiative reached nearly 7 million smallholder farmers globally with new technologies and, together with the United States’ Global Health Initiative, reached 12.5 million children with effective nutrition services. Building on its 2013 commitments to scale up improvements in international agriculture, the U.S. Government launched eight new projects in 2014 supporting improved seed enterprises and other technology providers to accelerate adoption and uptake by smallholder farmers of the most promising agricultural technologies. This $60 million investment will impact Feed the Future focus countries across Africa, Asia, and Latin America and the Caribbean. In May, the U.S. Agency for International Development launched its first Multi-Sectoral Nutrition Strategy , laying out a roadmap to reduce chronic malnutrition by 20 percent through the Feed the Future and Global Health initiatives, the Office of Food for Peace development programs, resilience efforts and other nutrition investments. This strategy precedes a forthcoming, government-wide Global Nutrition Coordination Plan. During October and November, the Department of State led a U.S. Government delegation that successfully negotiated the Rome Declaration on Nutrition and the Framework for Action, which were adopted by global consensus at the Second International Conference on Nutrition, co-convened by the World Health Organization and the Food and Agriculture Organization. Food security and nutrition will continue to be at the forefront of U.S. diplomatic efforts and ongoing negotiations on the Sustainable Development Goals in the Post-2015 framework, which build on the Millennium Development Goals. In September, as global leaders gathered in New York City for the 69th Session of the UN General Assembly, Secretary of State John Kerry and Secretary of Agriculture Tom Vilsack helped launch the Global Alliance for Climate Smart Agriculture during the United Nations Climate Summit, which called on government, finance, business and civil society leaders to take action on climate change. The Alliance advances a global, evidence-based approach to food security and represents an ambitious step in U.S. efforts to integrate a holistic approach to climate change in every area of our work. In September 2014, members of both the U.S. Senate and House of Representatives introduced authorizing legislation to codify and strengthen Feed the Future’s comprehensive approach to cultivating the transformative potential of agriculture sector-led growth. HR 5656 — the Feed the Future Global Food Security Act of 2014 — passed by a voice vote in the House of Representatives with strong bipartisan support in December. 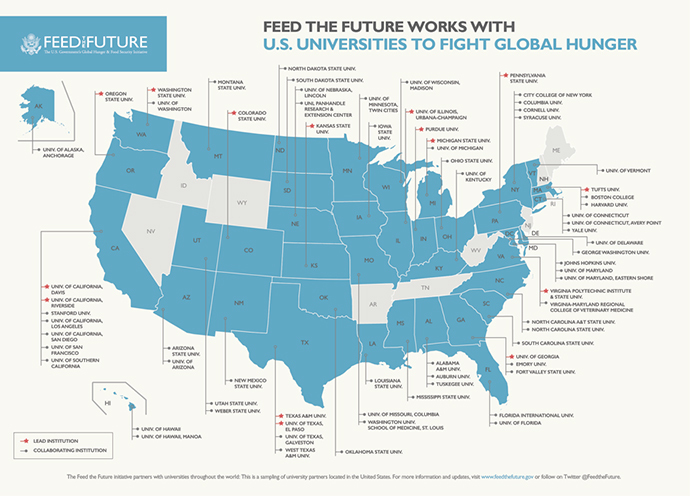 Housed at some of the top U.S. universities, Feed the Future Innovation Labs are on the cutting edge of efforts to research, develop and scale up safe and effective agricultural technologies that can help feed a growing population. Each of these examples is helping to create momentum for efforts this year, as we pursue a long-term vision of a world where the scourge of hunger, poverty, and malnutrition no longer threaten global peace and prosperity. As we start 2015, please take a moment to learn about global hunger and consider what you can do to help end it. You can start by reading Feed the Future’s “Year in Review” to learn more about our efforts and find out ways you can be involved. You can also follow @FeedtheFuture for the latest information. Nancy Stetson serves as U.S. Special Representative for Global Food Security at the U.S. Department of State, and Tjada D’Oyen McKenna is the Deputy Coordinator for Development for Feed the Future, the U.S. Government’s global hunger and food security initiative, as well as the Assistant to the Administrator in the U.S. Agency for International Development’s (USAID) Bureau for Food Security.